North Coast Wildfire Impact Study The Wine Business Institute (WBI) at Sonoma State University released preliminary findings of its wildfire impact study of the North Coast wine industry, based on a survey of more than 200 vineyard and winery stakeholders across Lake, Mendocino, Napa, Solano, and Sonoma counties. While the wildfires were unprecedented in Northern California, the findings indicate the actual impact on the North Coast wine industry was localized and limited. The most significant impact on the North Coast wine industry was an immediate and temporary slowdown of visitors to the region. Presumably this was due to images and reports at the height of the disaster. 99.8% of vineyard acres in the North Coast region were unaffected by recent fires. 93% of wineries were reported as unaffected in terms of structural damage or long-term impact. 99.5% of the total crop value was recovered. 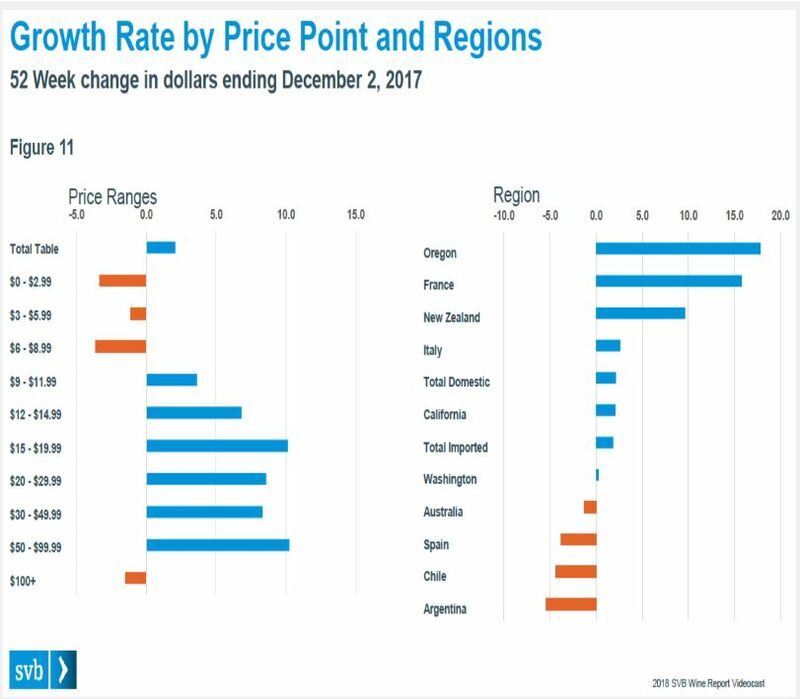 Many survey respondents reported a drop in tasting room traffic and sales, with visitation from outside California and the U.S. was most affected. Beginning in November, visitor traffic and tasting room sales returned to near normal. Other wine regions in the state reported a significant increase in visitor numbers during this period. 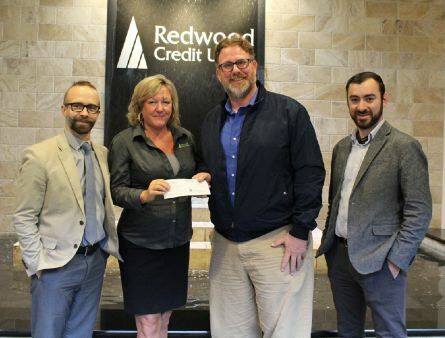 Over $15 million in charitable contributions have been made through a local credit union and other channels in support of those directly impacted by the fires. For further information, visit www.sonoma.edu/winebiz. SIP McMinnville Wine & Food Classic SIP is celebrating its Silver Anniversary of the McMinnville Wine & Food Classic, March 9-11, at the Evergreen Aviation and Space Museum. The festival brings together about 170 small independent producers of Oregon wine, beer, liquor, food and art for three days of tasting, toasting, and raising funds for St. James Catholic School in McMinnville, founded in 1906. Attendees can order through a streamlined system, allowing them to pick up at a valet counter upon leaving the festival. Beginning February 1, day pass tickets are $20 for adults and $17 for seniors and designated drivers. After entry, patrons pay for each tasting or food item on an individual basis. For more details, visit www.sipclassic.org and to plan your time in the area, visit www.visitmcminnville.com/. Le Paulée de San Francisco The La Paulée Burgundy Festival in San Francisco February 27-March 3, 2018, allows guests to sample current releases and older vintages from some of the most sought-after domaines of Burgundy. The wine service is led by over fifty of the nation’s notable sommeliers. Tickets are now on sale including offers exclusively for American Express card members at www.lapaulee.com. Setting the Record Straight A reader pointed out to me that many writers and references attribute the success of Oregon Pinot Noir to the fact that the Willamette Valley and Burgundy are at the same latitude. The truth is, they aren’t! The Willamette Valley is at 45 degrees latitude, while Burgundy is at 47 degrees latitude including the Côte d’Or. 47 degrees in the United States would put you in Tacoma, Washington and 45 degrees in France would put you much closer to Bordeaux. Also, the 45th parallel runs through St. Paul, Minnesota and Ottawa, Canada (try growing Pinot Noir in either of those places). Another perpetuated myth has been debunked! 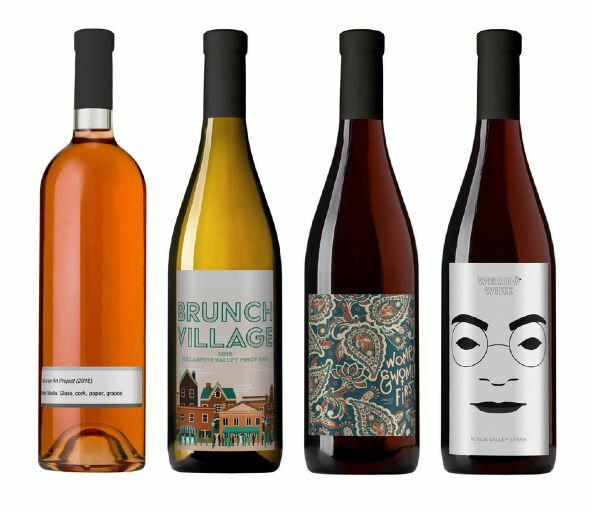 Golden Gate Wine Cellars Owner Frank Melis stocks very hard-to-get domestic Pinot Noir wines that are usually only available to winery mailing list customers. He is able to buy directly from the winery at wholesale prices and sell the wines at retail prices. Golden Gate Wine Cellars, started in June of 2005, specializes in boutique California wineries. Melis previously ran another high-end wine retail store in San Francisco for over a decade. He organizes weekly wine tastings, hosts winery owners and winemakers and every year conducts one large wine tasting out-of-state. His portfolio includes Pinot Noir wineries such as Paul Lato, Mail Road, (DuMOL - Melis was their first retail client), Cattleya, and Pisoni. You can also find wines from Colgin, Screaming Eagle, Harlan, Bench, Kamen, and Kongsgaard. Visit the website at www.goldengatewinecellars.com or contact Frank Melis directly if you are looking for something special at frank@ggwc.com. Top Ten Wine Grape Varieties in the World Per and Britt Karlsson composed an article at www.forbes.com that breaks down the planted acreage of the most widely planted grape varieties. The most grown grape variety for wine is Cabernet Sauvignon (840,000 acres). Number two is Merlot, three is Tempranillo, four is Airén (a white grape used in Spain for unpretentious wines), five is Chardonnay, six is Syrah, seven is Grenache Noir, eight is Sauvignon Blanc, nine is Pinot Noir (285,000 acres), and ten is Trebbiano Toscano/Ugni Blanc. 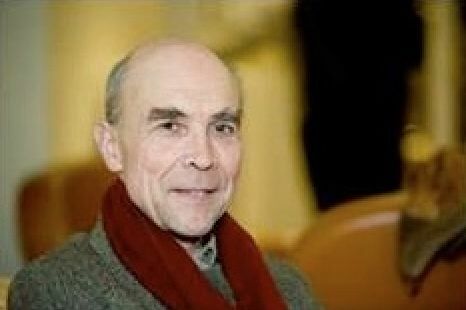 DRC’s Aubert de Villaine Thinks 2015 Most Remarkable Vintage of His Career de Villaine spoke to the drinks business at https://www.thedrinksbusiness.com/2018/01/de-villaine-2015-is-themost- remarkable-vintage-of-my-career/. He said, “I have never seen a season where the vineyards were so beautiful from beginning to end.” He went on to say in reference to the wines, “They have a serenity and peacefulness about them that was a reflection of the well-being of the vineyards.” This is a remarkable statement considering de Villaine has participated in over fifty vintages. DRC used 100% whole cluster in 2015, only employed recently in 2005 and 2009. DRC has always used some whole cluster in fermentations, but the portion used in this manner must have high maturity and ripening to ensure the stems don’t transmit a stalky character to the wines. Yields in 2015 for every DRC bottling were smaller than in 2014. The smaller harvest and superiority of the vintage has led to a rise in prices between 17%-31% depending on the bottling. 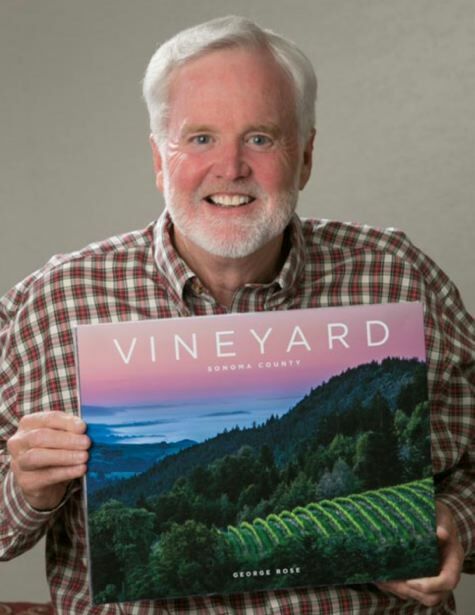 New Book: ‘VINEYARD: Sonoma County’ George Rose is a well-known wine photography based in Sonoma County. In this book, he shows the diversity and personality of vineyards through photographs he has accumulated in over 25 years exploring Sonoma County. The last photograph in the book is of Paradise Ridge and its beloved LOVE sculpture at sunset, before the October wildfires. This sculpture survived the fire and has become a symbol of Santa Rosa’s community coming together in the recovery process. The book ($80) is available at www.georgerose.com. Some of the profits of the sale of the book will be donated to the Sonoma County Grape Grower Foundation to support vineyard workers who were displaced by the fires. MIT Biochemical Engineer May Save Pinot Noir from Warming Climate Change At Massachusetts Institute of Technology, biochemical engineer Jean-Francois Hamel has discovered the secrets to how natural yeasts affect flavors and alcohol levels in wine and in turn may save wine grapes from the damaging effects of climate warming. An an article written by Elon McCoy appeared in BloombergPursuits, https://www.bloomberg.com/news/articles/2018-01-23/winemakers-turn-to-mit-to-save-pinot-noir-in-warmingtemperatures. Hamel, a Frenchman, was enlisted by Oregon Chapter 24 winery owner Mark Tarlov and its winemaker Louis Michel Liger-Belair to try to figure out how indigenous yeasts in their vineyards could make elegant and complex wines even with increasingly warm temperatures. The results of Hamel’s research have been bottled and the winery’s first single-vineyard Pinot Noir wines will be available beginning February 1 ($120 a bottle). Chapter 24 has found that each of their vineyard sites has its own mix of wild yeasts that contribute to the terroir of the vineyard. The primary yeast for winemaking, Saccharomyces cerevisiae acts on grape sugars and produces high levels of alcohol. It competes with the weaker non-Saccharomyces types and together they produce many different flavors and aromas. The non-Saccharomyces types tend to produce less alcohol. Both yeast types need oxygen to thrive. For the 2016 vintage, Chapter 24 used hand-sprayed aerobic pump overs at the beginning of fermentation to provide additional oxygen and allow non-Saccaromyces yeasts to survive longer. The result is that the 2016 Chapter 24 Pinot Noir wines had the same alcohol as wines from the previous vintage, even though the weather during the 2016 growing season was much hotter. The results suggest the possibility of producing Pinot Noir with lower alcohol levels and higher acidity without turning to de-alcoholization. Hamel is directing further research into determining how much oxygen is ideal during fermentation and how to precisely add it to control a wine’s eventual alcohol level. Four Chapter 24 Pinot Noir wines grown in volcanic soils are being released to winery by allocation: 2016 Warden Hill ($120), 2016 Hopewell Hills ($120), 2016 Highland ($180) and 2016 Stone Creek ($180). The winery is located in Salem, Oregon, and is open only by appointment. Visit www.chapter24vineyards.com.